New Delhi: The centre should explore the possibility of a legislation conferring on farmers ‘the right to sell at minimum support prices (MSP)’, a government panel has recommended. CACP is a statutory body under the agriculture ministry whose recommendations form the basis of MSP announcements by the centre. The latest observations are from the commission’s Kharif price policy report released on Wednesday, after the government announced higher support prices. On Wednesday, the centre approved significant hikes in MSP of 14 Kharif crops for the 2018-19 season. While MSP for paddy was raised by 13% to ₹ 1750 per quintal, support prices for soybean, groundnut, moong and cotton were raised between 10% and 28% year-on-year. The CACP said in its report that MSPs for many crops, particularly water-intensive crops like paddy, are higher. “The main challenge would be to ensure that farmers receive at least the announced MSP and India is able to retain its competitiveness in world markets," it said. The report added that the “role and participation of state governments and private sector is extremely important to make these interventions effective as well as ensure remunerative prices to farmers." The CACP further suggested that “efforts are needed to create effective procurement system or alternative models like Bhavantar Bhugtan Yojana (BBY) in Madhya Pradesh and proposed Market Assurance Scheme (where centre and states share the costs of procuring pulses and oilseeds)." Presently, farmers rarely benefit from higher MSP announcements except for crops like rice and wheat where the government procures heavily—over a third of the crop size—to supply to the subsidised public distribution system. For coarse grains like jowar and bajra, and for several varieties of oilseeds and pulses, government procurement is minimal. 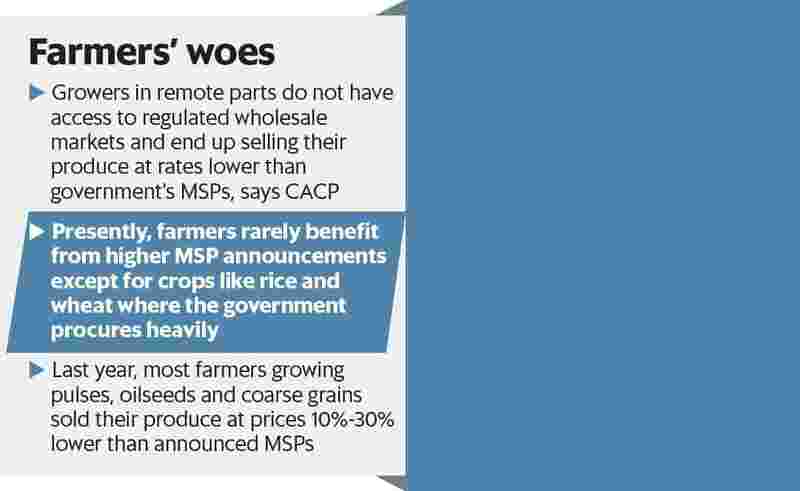 For instance, last year, most farmers growing pulses, oilseeds and coarse grains sold their produce at prices 10%-30% lower than announced MSPs. The CACP’s suggestion to make MSP a legal entitlement is in line with what farmer organisations have been demanding. The All India Kisan Sangharsh Coordination Committee, an umbrella body of over 180 farmer unions, is going to push a private member bill in the upcoming monsoon session of the Parliament seeking guaranteed remunerative MSP for all farm commodities.